Soft cover, 64 pages, English text; black-and-white and colour photographs; colour profiles. Interesting and easy to read text; varied collection of period photographs; inspiring aircraft profiles, illustrations and paintings; inclusion of first-hand accounts. A publication that gives the reader an excellent over view of one WWI’s most famous fighters. The Sopwith Camel is one of the best known fighters of World War One. Its design, frontal mass, and torque of the large rotary engine, gave it unrivalled manoeuvrability. This came at a cost though as a large number of accidents occurred with new pilots who were not familiar with the sensitive controls. But in the right hands, the type was able to rack up a remarkable number of victories. This is the third instalment in Osprey’s Air Vanguard series. Inside the soft card covers are 64 pages of text, photographs and colour illustrations. Included in the latter are 8 aircraft profiles, plus another with extra plan and frontal views. These are from the desk of Harry Dempsey and all are up to his usual high standards. The narrative starts off by taking the reader through the design and development of the type. This is followed by a discussion of the technical specifications, plus a brief description of variants such as the Night Fighter, Comic, two-seater, monoplane, Trench Fighter 1 and shipboard Camel. Most of the remaining text is devoted to the type’s operational history, with the author relating encounters on the Western Front, Italy and the East. Carrier operations are not forgotten and nor are the post war operations. It’s all explained in an easy to read “conversational” style that doesn’t bog the reader down in statistics. Good use is made of the various pilot diaries, letters and interviews available to the author. These provide an interesting “first hand” commentary on what it’s like to fly the Camel, and also what it was like to use it in combat. Naturally a book of this size necessitates only a brief description of the Camel’s career but one still gets an excellent overview of operations. Helping the cause are 43 black and white period photographs, plus a couple of extra images from museums. Some inspirational artwork comes courtesy of Simon Smith. Both of his “paintings” are printed across a single page which is a welcome format change over previous double page spreads. Rounding out the publication is a cutaway drawing that illustrates some of the essential elements found under the Camel’s skin. 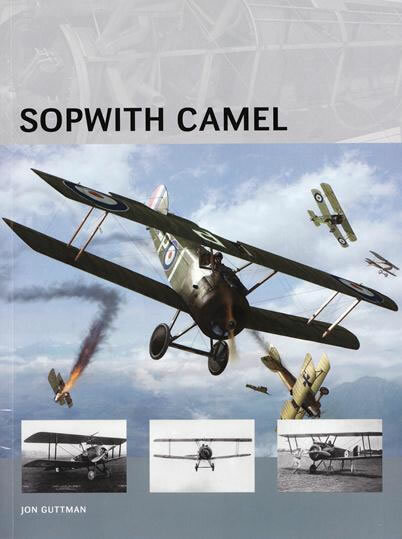 This is an excellent primer for those wanting to gain a better understanding of the Sopwith Camel. The presentation is first-class and John Guttman presents the information in his usual efficient and informative way. With the excellent graphics from recognised artists, the result is a worthy addition to the Air Vanguard series.